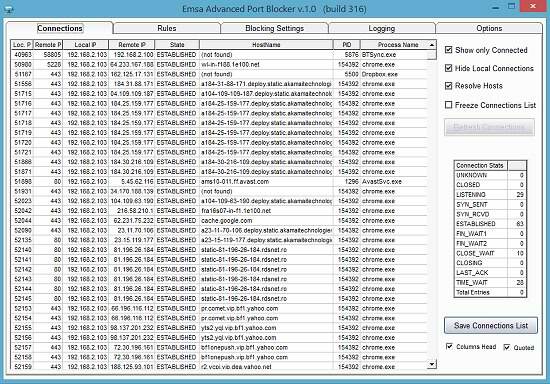 Our product Advanced Port Blocker is an efficient IP address blocker. You can monitor and block IP addresses connecting to/from your computer. It all depends on the remote IP address of the connection, but much more complex rules are possible including ports, port ranges etc. All TCP connections and IP addresses are monitored, logged and blocked if necessary, based on user configuration. This product is not a firewall but works in a similar fashion based on configurable rules. With this tool you can control IP addresses connecting to/from your computer. The product also discovers hostnames associated to a given IP address, and these are updated periodically. APB is fast by design, lightweight, small in file size and with low memory usage. This program is provided as an installer executable. To uninstall, use the Add/Remove programs feature in your Control Panel. Any usual Windows machine with a few MB of free disk space will do.